RPF picks up Rwandan young people unemployed and often not attended school and leads to finally deliver to the war in eastern of Congo and combat at the side of CNDP/M23 led by general Bosco Ntaganda, wanted by the International Criminal Court for serious war crimes, crimes against humanity and crime of recruitment of children in army. Information provided to us by people who is at the place where these military training field confirm that a group of more than two hundred young people who have been recruited and trained militarily during more than a month in Kinazi sector, Ruhango district, South province, were loaded into military trucks this morning on 7 July 2012 to be sent to Eastern Congo. The training of these Rwanda young civilian, information circulating at the time where the Rwanda and Kagame, is accused by the United Nations of supporting the rebels of the M23 in the war between them and the loyalist army in the DRC. These Rwandan youth are recruited by force with assistance and supervision of members of Rwanda military high command of the province. 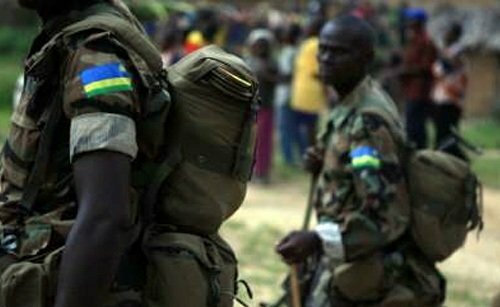 The blog Rwanda in Liberation Process was also informed by reliable sources that Rwanda has recruited a large number of young refugees who had arrived to the camp of Congolese refugees (Rwandan origin) of Kigeme in Nyamagabe district, he trained them ant then returned to combat. That is the same for young Rwandan boys who are picked up in the streets of Kigali. Why Rwanda denies and denied by lying that he doesn’t support the rebels of CNDP/M23 then the proofs are there and are more daunting? must be that Kagame stop forcing Rwandan youth who are not experienced in warfare and combat for innocently to fall under the ballets for his proper personal interests. ariko ubundi abanyamurenge barahorwa iki , ni uko bavuga ikinyarwanda se? ABANTU KIKI MWANGA UKURI? IYO UMUNTU AKENSHI ARWANA ABESYA NIBYO ARWANIRA AKENSHI ARIBIHUGURANO NTASHOBORA GUTSINDA INTAMBARA NARIMWE, ABANYAMURENGE BARARWANIRA AHABO NIBA ABAHUTU BABACONGO BATABAKUNDA KIVU YEPFO NIYARUGURU HARIKURWANDA NIMUBAHAGARURIRE MAZE UREBE KO BATABAREKA NIBA ATARIBYO BARABARASA NA KINSHASHA EJO BAZAYIFATA, KUKO BO BARWANA NKA BANYAMERICA MBA NDOGA NYABUGURU.